Mommy's Nest: A B C, 1 2 3, baby you and me, yeah! A B C, 1 2 3, baby you and me, yeah! My FAVORITE thing was not made by my mother, but my father. I spared my mother the shame that was the grossest meal I ever ate last week. It was tough to resist, but I did. But this week, I had to talk about my favorite thing my father made for me. My dad did not cook very often. He can, but he just didn't. I liked these sloppy joe's SO much that I asked my dad to make them for my birthday party when I was like 17 or something. I am sure my friends thought they were weird. But I didn't care at all. I loved them. And I love my dad. So, nyah. Now go - pick your prompt and get on the MamaKat-wagon. 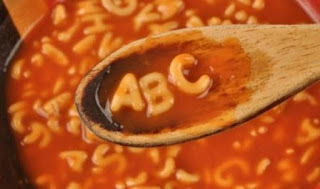 I would never have thought to do put alphabet soup in sloppy joes. Now I'm kind of tempted to try it. Now that is creative. I may have to try that and see if I can impress folks here. What a fun meal! My mom used to make both of these dishes, but never together.